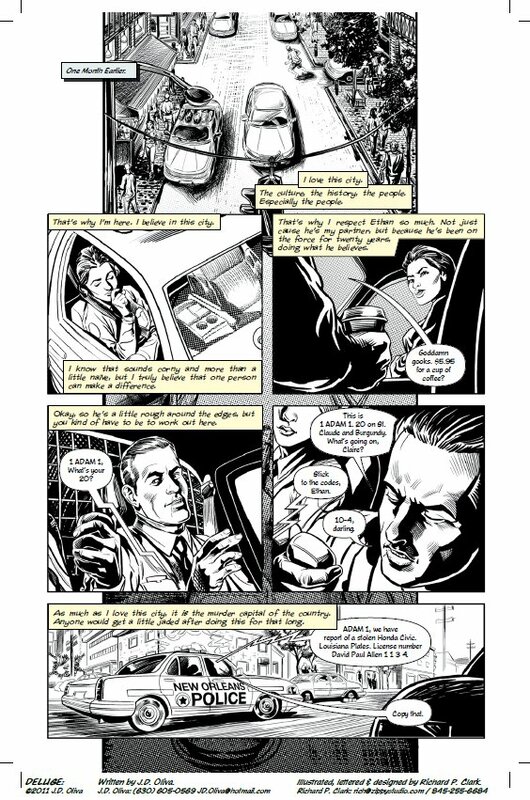 11-NOV-2011 If you want more real world crime dramas in your comics collection then follow the links to a new Kickstarter campaign and support DELUGE by J.D. Oliva and Richard Clark. Rich Clark beautifully illustrates human expressions and landscapes the way a well-seasoned comics veteran could. You may not know his name but his 15 years of experience show in DELUGE. 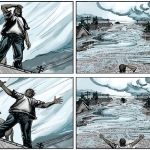 His passion is evident in the story’s second page showing a character elated to be alive, isolated on a rooftop as the Hurricane Katrina floods wipe the city away. It’s as if Clark was drawing his own expression of seeing these collaborative efforts come to fruition after the long journey of plotting, scripting, sketching, editing and revising this project. Pain, angst, greed and hopelessness are woven through DELUGE’S characters. Just like Kody Chamberlain’s glorious modern noir comic SWEETS, Oliva and Clark present the city of New Orleans as her own character. She’s been enjoyed with passions and decadence only to be devastated by the country’s worst storm. 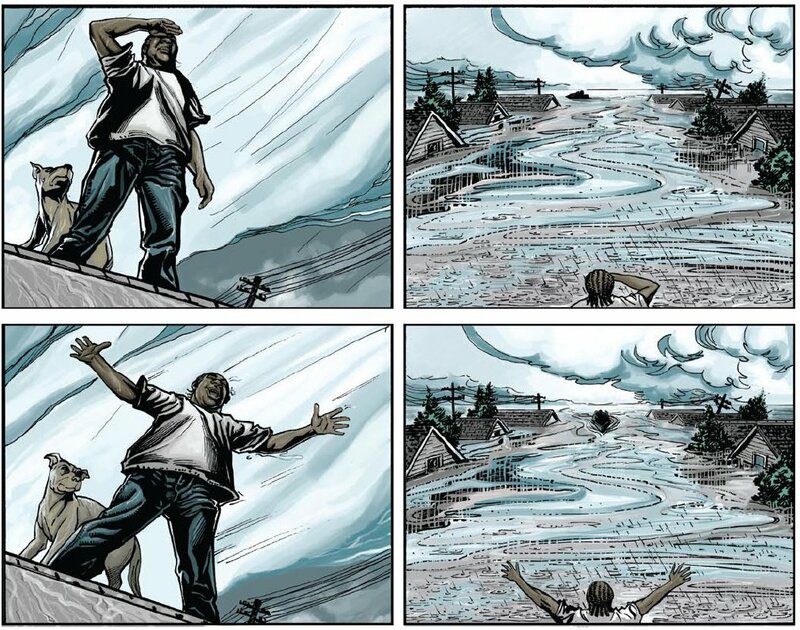 The city versus the hurricane – like two formidable comic book characters that have engaged in a battle, DELUGE doesn’t take readers to the point of victory on either side but shows the more realistic outcome of tragedy felt all around. DIRTY COPS, VIGILANTES AND DRUGS – other well oiled tools in the machine of noir storytelling. DELUGE’S human characters involve detectives so deep undercover that their true identities can’t be believed. When these good guys encounter survivors who happen to be the city’s true enemy, there’s a sense of vertigo felt through the dizzying emotions as a reader questions which ones will actually make it out of the floods alive. Oliva sprinkles in biblical text without trying to hide what some Americans have expressed about the city of New Orleans. It’s the modern Gomorrah (Las Vegas being Sodom usually). Utilizing New Orleans as an environment was a wise choice. A cop story could be set just about anywhere: Chicago, New York, Los Angeles; but New Orleans brings a distinction of character that sets it apart. It’s not known for having the highest paid professional athletes or for celebrity sightings in designer boutiques. New Orleans is known for two things: arts and crime, an almost laughable yin and yang if it weren’t so sad. 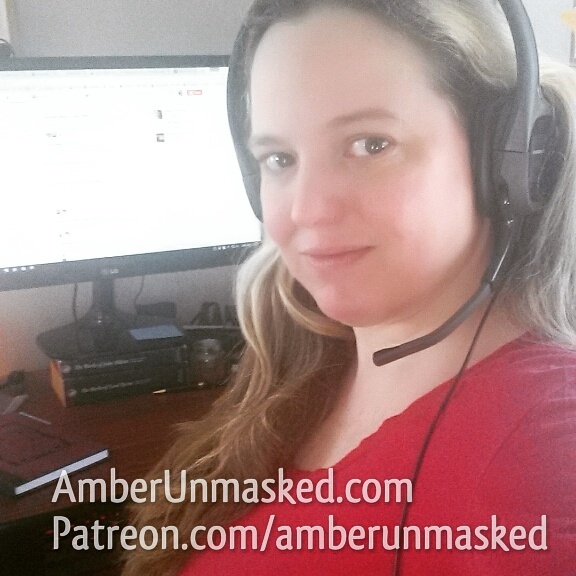 The donation incentives include plenty of Kickstarter exclusives including the opportunity to be drawn into the book! Join in the Kickstarter “army” as Jimmy Palmiotti called his supporters, and donate to the crowdfunding and share the links. Bring another creator-owned comic book into our reality and share the love of the medium with your friends.